​Two popular Ardmore businesses, entertainment mainstay Ardmore Music Hall and restaurant hotspot Ripplewood Whiskey & Craft, are joining forces in a new partnership between current AMH owner Chris Perella and Ripplewood owners Biff Gottehrer and Pete Martin. Martin, who purchased the real estate of the former Fellini Café at 29 East Lancaster and adjacent storefronts, approached Perella last fall to discuss the possibility of combining their efforts on Lancaster Avenue. Of the partnership with Ripplewood, Perella shares that it is both “special and sensible” as the teams operating both businesses will be able to share resources, ideas, staff, and support to create an unparalleled fan & guest experience. Perella, Gottehrer, Martin and their management team are currently planning for exciting futures for both businesses, including capital improvements to AMH, such as a Lancaster Avenue-facing marquee and improvements to the service and comfort of the venue for fans & artists. 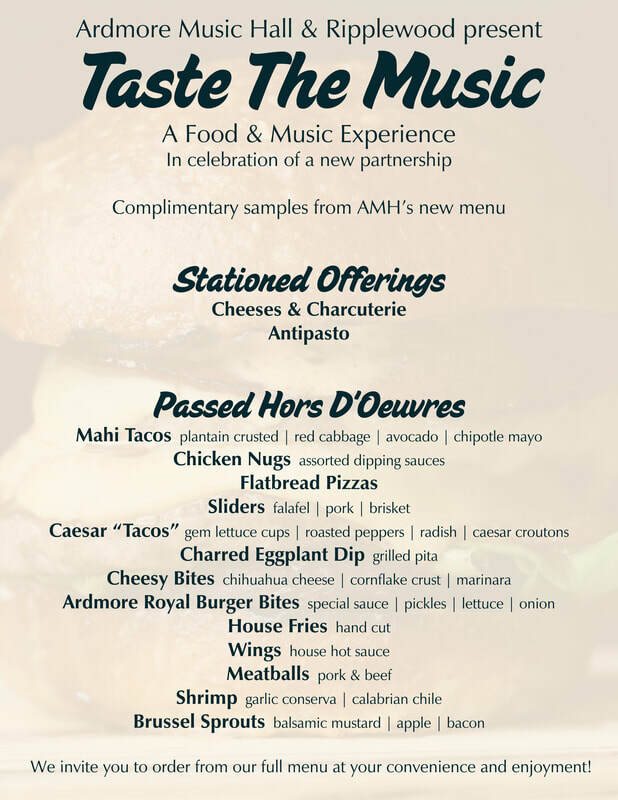 One of the first ways they are combining efforts is the introduction of new menus at Ardmore Music Hall. “We’re excited to elevate the food and beverage program at AMH” Perella says. “Offering diverse and interesting food at the Music Hall is something we’ve always wanted to do, but was difficult considering we are concert-focused first and foremost. With support from the Ripplewood team, we’ll be able to offer more fresh, seasonal and inspired food options. This is just the first of many ways we plan to grow with each other, and this community”. To celebrate their partnership and highlight the new and exciting food program, Ardmore Music Hall will be open to the public with an event on Friday April 12th. Guests will be able to sample more than a dozen items from the new menu, created by the Ripplewood & AMH team led by Executive Chef Biff Gottehrer, as well as offerings from the Banquet / Private Events menu featured for Weddings, Mitzvahs & more. In addition to sampling the new dishes, guests will enjoy samples of new craft cocktails created by the Ripplewood & AMH operations team. Live music from two great local bands- The Whiskeyhickon Boys and The Sermon - will provide the soundtrack to the party.